Although the song “It’s the Most Wonderful Time of the Year” was made for the holidays, I find the lyrics playing in my head as I stroll down the aisles of the farmers market these days. Tomatoes of all colors, crisp cucumbers, zucchini of every size, bags full of sweet corn piled high, winter squash, pears and apples just starting to arrive. It’s the true essence of a beautiful summer meets fall collision. I also enjoy listening to the chatter on Twitter and in the office, people bouncing ideas off one other for what to do with this or that from their over abundant gardens. Fortunately, one of these conversations worked out quite nicely for me, as I was gifted 4 pounds of these gorgeous little Seckel pears from a co-worker of Brian’s whose tree is plumb full this year. We ate several of them straight from the bag and sliced onto socca with blue cheese, honey and walnuts. 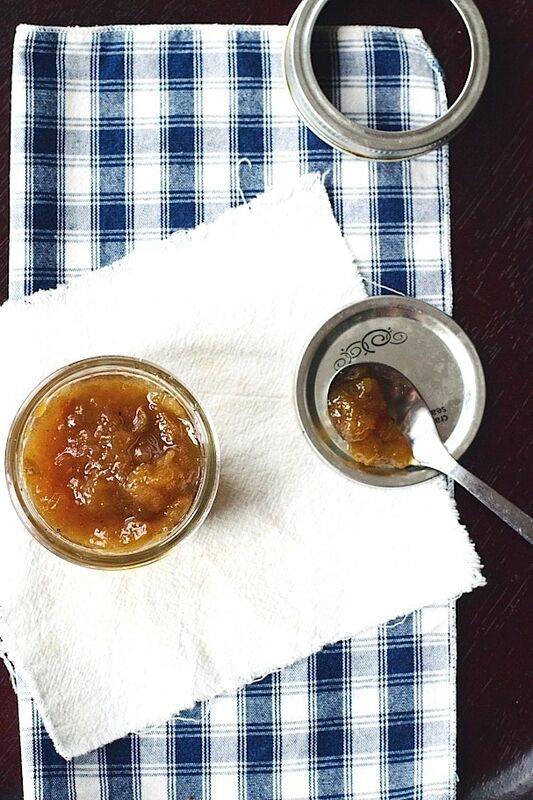 This recipe is a slight adaptation from the master preserving wizard herself, Marisa of Food in Jars, who made this brown sugar based pear jam. With the addition of flaky sea salt and double the simmering time, this version resembles caramel decadence in jam form. 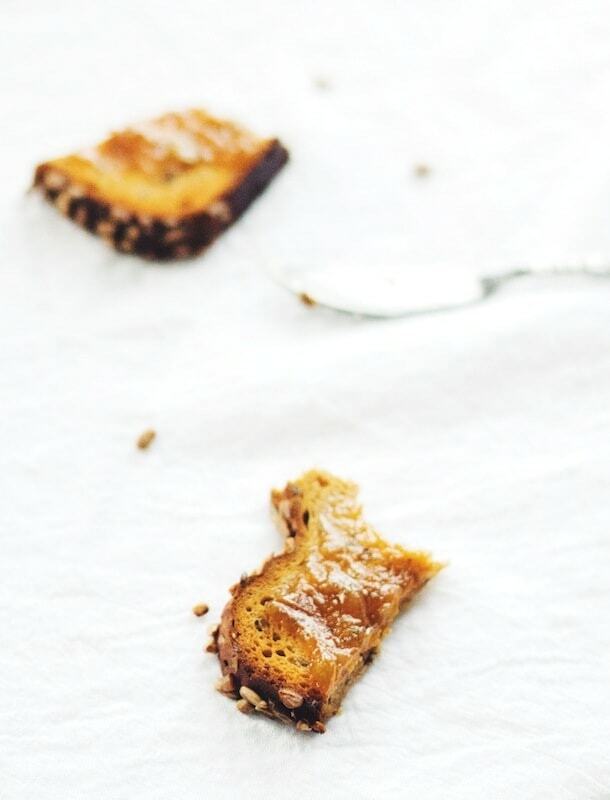 The brown sugar boils down into a sticky, sweet mess, and the addition of cardamom is what autumn comfort is all about. Cardamom is one of my favorite warming spices, such a lovely match to the slight spice of the seckel pears. I ground the seeds of the green pods with a mortar and pestle, it’s scent so unique – a hint of eucalyptus and citrus and cloves. Used this way the spice is quite potent, which is why you’ll see two measurements – one for if you grind it yourself, the other if you buy it pre-ground, where exposure to air tames it down a bit. Getting this jam to set couldn’t be easier. It naturally happens as the fruit simmers for an hour and the juice of a lemon at the end gives it the acidity it needs for canning safety, no artificial pectin needed. I peeled half of the pears, but left the others with the skin on because I like a little bit of texture. 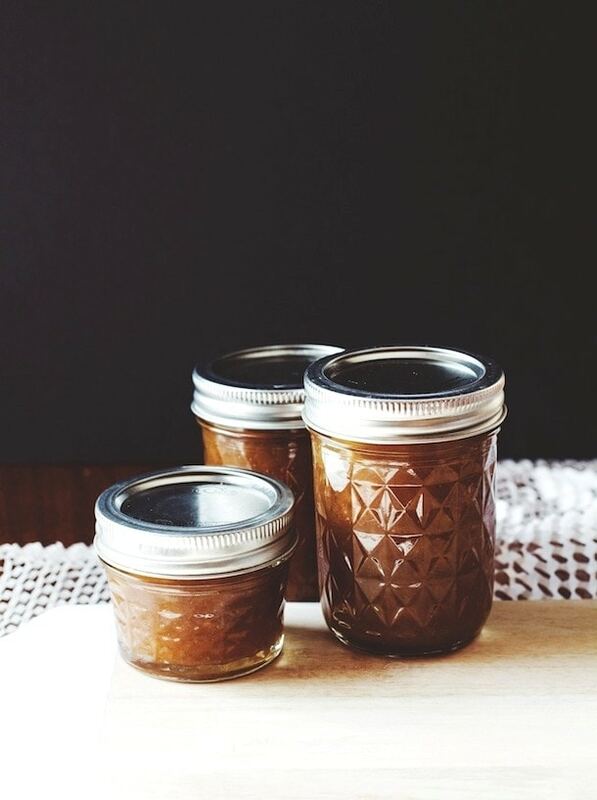 (If you like something completely smooth, this Vanilla Chai Pear Butter is delicious too.) The end result is lush, fudgy preserves that are just sweet enough with the addition of salt for that homemade caramel taste. 1. Sterilize jars in boiling water canner, lids too if you are using those made prior to 2013. See new rules about canning regulations regarding lids here. 2. 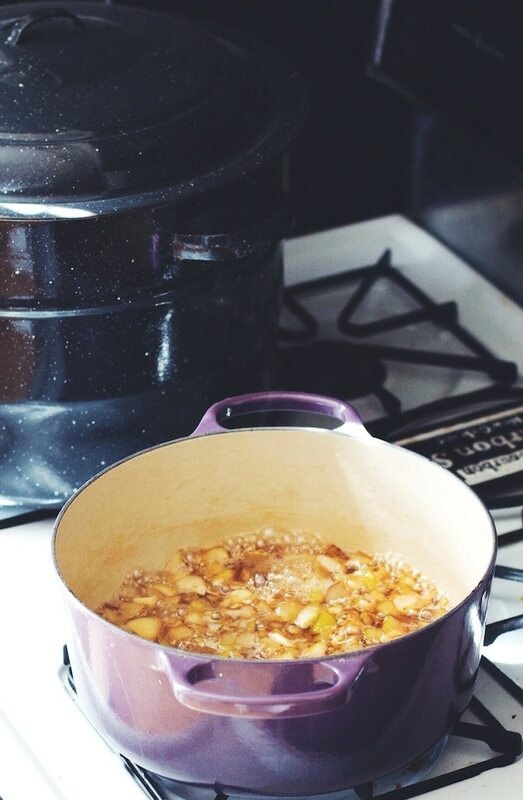 Coarsely chop the pears, then combine them with the sugar in a large pot and bring to a boil over medium heat, stirring to dissolve the sugar. Simmer, stirring frequently and lightly mash with a potato masher the pears soften, until the mixture thickens and is syrupy. This will take about 45 minutes, and you will see larger bubbles forming in the simmer. Stir in the salt, lemon juice and cardamom, then simmer for 2 more minutes. 3. Ladle the hot preserves into hot jars leaving 1/4 inch headspace. Remove any air bubbles. Wipe the rims. Center the lids on the jars. Apply bands until the fit is just tight. 4. Process the jars in a boiling water bath canner for 10 minutes, adjusting for altitude. Turn off the heat and let the jars sit for 5 minutes then remove the jars and let cool in a draft-free spot overnight. Check the lids for seal after 24 hours – they should not flex up and down when the center is pressed. Store in a cool, dark place for up to one year. Alternatively, if you don’t want to mess with the canning, you can skip the whole jar sterilizing and boiling water bath process and just store in clean, air-tight jars in the refrigerator for up to a month. What a lovely combination of flavours, the hint of cardamom is a wonderful touch. Thank you Kathryn. Safe travels this September as I see you’re off on another journey! Gorgeous pics Amanda! 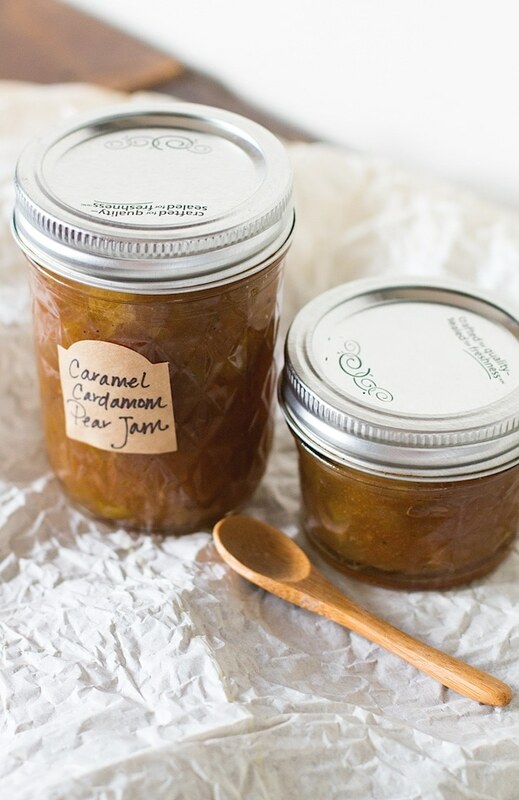 And totally loving the warm fall flavors of this jam… perfect for a cold morning on toast! Totally making this girl! Thank you for stopping by! Yes, it’s great on warm toast, and I’m also loving it stirred into muesli. Let me know if you do end up making it! Beautiful photos, and what a delicious sounding combination. Any gift of food is a good gift. Thank you friend :) If I get a chance to make another batch of this, there will be a jar with your name on it. Also, we may need to put in an order for those Harry and David pears again this winter! What a great recipe! And girl… these photos are STUNNING!! You are so talented! Thank you Thea! I think this jam would be great on your whole wheat buckwheat pancakes. What a lovely fall breakfast that would be. Thanks Patricia! I just love canning when the weather starts to be a bit cooler. The smell of this floating through the house is like sugar plum fairies. Love the sound of this jam! 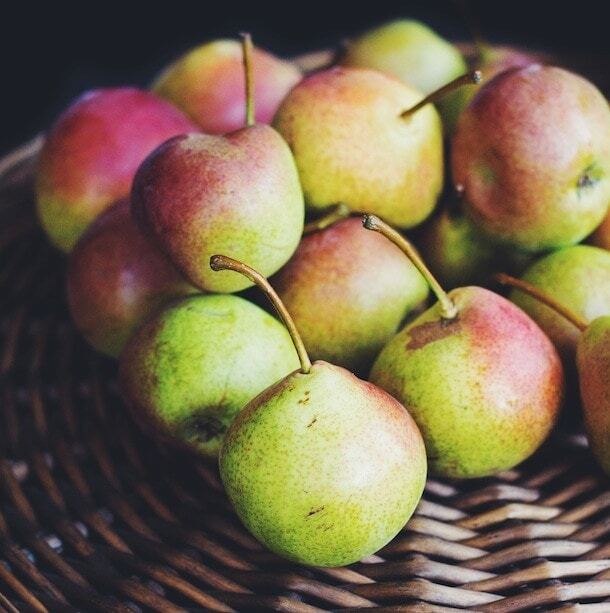 I’m not very good at using pears in my kitchen, so I’m always looking for inspiring pear recipes and this certainly is one. This jam looks delicious, Amanda! Pear + cardamom seems like such a nice combination. And I love this time of year too, just before fall officially comes. I just wish it lasted a little longer! I wish it lasted a little longer too Julia! At least apples and squash store well, and I love putting things like this up so I can enjoy a taste of summer in the colder months. Sorry, by 11/4 cups brown sugar do you mean 11 1/4 cups, or 11 cups or..? Thanks for posting, the jam looks terrific! Hi Kelsey – it is 1 and 1/4 cups brown sugar, not 11. sometimes my font gets a little squished, sorry about that. hope you enjoy! I think the all-spice would be okay if you like it! Otherwise I would stick with cardamom. A slow cooker would also work to make this, but it isn’t a lot of liquid so I would keep it on low and watch carefully to make sure it doesn’t burn. Discard the last comment.. lol :) Going to try it now. Wish me luck! Correct, no pectin needed because of the acid from the lemon juice and pear skin. You can do it! Does this scale up okay? 3 half pint jars just seems like such a small amount. :0 I think I’ll have to make 4x the recipe, to make it work for Christmas presents! Will that works? It looks and sounds delicious! :) Thanks. Hi Rachel! I’m not sure about making 4x the amount, it might be hard to get it to set. What I would do in that situation is make a larger scale pear jam recipe that you find and add 1 teaspoon per 6 pints. Hope that helps! Hello, have you ever tried with Apples? Terrific! I just love the natural sweetness and depth in this jam. Nice that it makes a small batch too! Hi, I followed the recipe and it looks and smells wonderful, but the jam seems a little runny, will it set more over time? hi! the jam will get thicker when it is the refrigerator. I would say that next time you make it, cook a little longer to really get it to concentrate and allow more liquid to evaporate. that way you will achieve a thicker set right away. hope you enjoy! My wife and I make lots of jams and this one sounds really good. Can it be doubled? 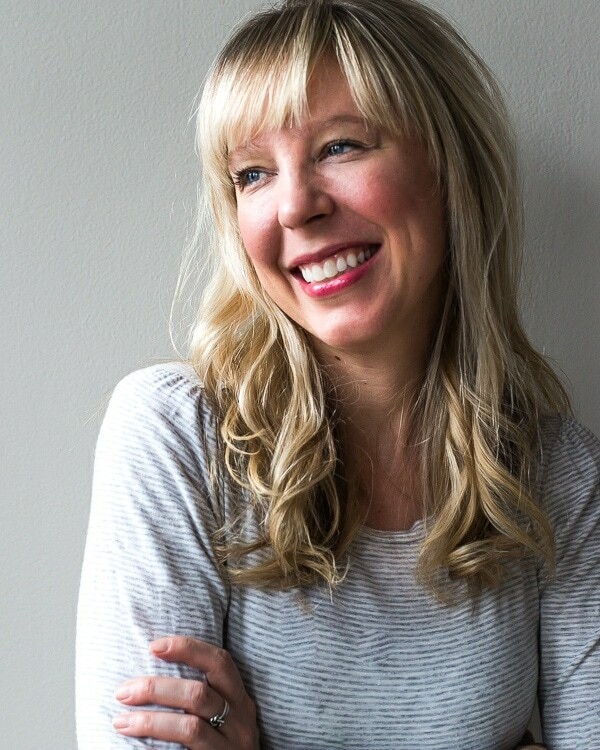 This is such a great story Rachel, thank you for sharing it with me! I’m so glad you liked the jam, and I hope Nonna does too. You made my day, xo. 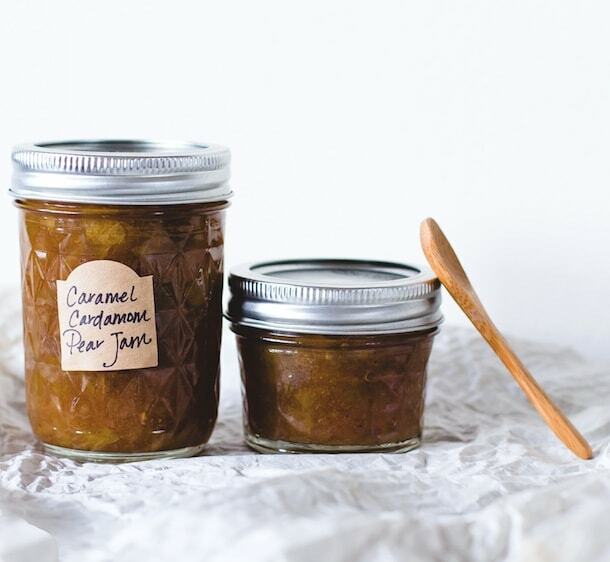 Is it ok not to use SureJell in this recipe for the Cardamon Pear Jam? Correct – the recipe has not been tested with SureJell. 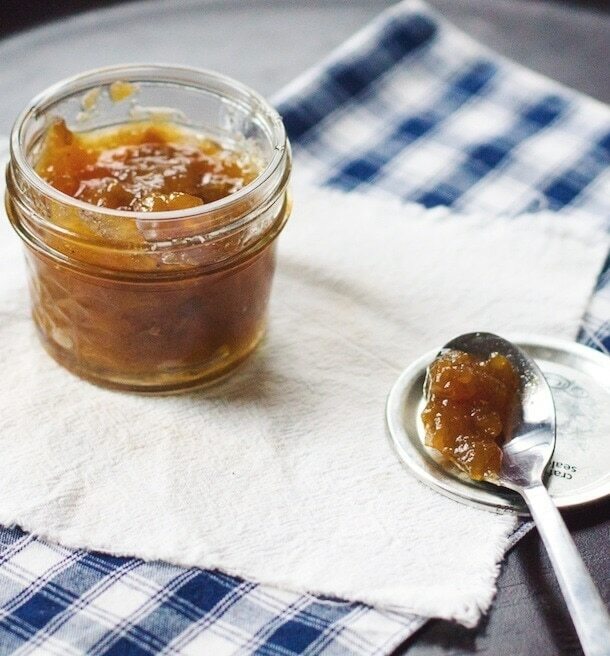 I stay away from artificial pectin, which is why this recipe is made without it. We love canning during the summer, but I miss it so much during the winter time!! With pears in season I have some more canning to do – like NOW!! This is stunning! i love canning too! and so i got the itch with the pears that were around in winter. it is so good in oatmeal! thanks for stopping by Megan! I recently mailed my brother and his girlfriend a jar of nectarine jam. He loved it so much, he has been pestering me to send him more ever since. Yesterday he called to “place an order”. He asked for 2 jars of peach jam, 2 jars of pear jam and 2 jars of nectarine jam. I found this funny, since I’ve never made peach and pear jam before. He was pretty persistent and did tell me that money is no object. Cardamom has always been my favorite spice, so this sounds right up my alley. I will give this recipe a try and see if my brother approves. Thank you so much for sharing! wonderful! happy to hear you found this recipe to make for your brother. hope all of you enjoy. I just made this pear and it is so amazing. We have a Bartlett pear tree that’s busting with fruit and I love making things for my co-workers at Christmas time. The only part I don’t enjoy is killing the pears and I wish I got a lot more jars but other than that it’s amazing. Going to try your vanilla chai pear butter next weekend. So glad you liked the recipe! And what a lovely gift you’ll now have to give to others. I’m jealous you have your own pear tree! I’m in Kathmandu, Nepal and this recipe seems like the perfect little taste of Autumn that I’m missing here. My pears are bubbling away as we speak. I know you won’t see this in time for this batch, but hopefully before the next… Our lemons here are tiny, about the size of key Limes — do you have an approximate measurement for how much juice “one large lemon” produces? I guessed 3 of mine might be equivalent, but a ballpark figure would be super helpful. Thanks for such great inspiration! I’d guess two of yours would be an equivalent to one medium lemon here. So three is probably right! So fun that you are making the recipe all the way over in Nepal. Hope it turns out well for you.